If you have large trees in your yard, there’s no doubt you enjoy the shade, beauty, fall foliage and many other wonders of nature in action. The downside however, is that trees can hang over your home and cause roof damage, roots can grow into your septic system or the foundation of the home, and during storms, they can be blown over by strong wind and cause major damage to your home. In this DIY Review Guide, we’ll help you understand when to call in a tree removal service and an approximate range of the tree removal cost you need to set a budget for. Hundreds of homeowners drop trees onto their home every year when they mistakenly think they can cut down their own tree. Don’t make the same mistake! The cost to remove a tree is far less than you think! According to Costhelper.com, below are the typical costs for removing trees, however, this will depend upon the height, width, proximity to structures or power lines and number of branches. Small trees up to about 30-feet high, such as a Black Mulberry, Dogwood or Russian Olive, with clearance of buildings and utility lines cost about $125-$437 to remove. Medium-sized trees from 30-60 feet tall including the Black Alder, Black Gum and Crabapple, that are set apart from buildings and utilities run $175-$900. Large trees 60-80 feet high, including Red Oak, Pine and Black Locust, are estimated at $400-$1,000. Trees 80-100 feet tall such as the American Ash, Bur Oak and Sugar Maple can cost anywhere from $962-$1,400+. Is The Tree Hanging Over House? Maybe you just bought a home where the homeowners didn’t keep their trees pruned to prevent over-growth. Or maybe it is a very old tree that you just didn’t want to cut for sentimental purposes. Regardless of the reason, if you have a tree that hangs over your home, this goes to the top of the list of “Don’t DIY!” Whether the tree is close to a building or hanging over your home or roof, the tree cannot just be taken down with one cut near the bottom. If this is done, you have zero control over where it will land, if it will go through your roof or worse, your neighbors home. These trees should be removed by a process called “roping them down”. In basic terms this means that the tree will be climbed and a rope attached to the top and pulled down with pulleys or other machinery. The tree is then cut off in sections and lowered to the ground. Although there will be occasions when the landscaping company will rope the tree at the top, cut at the bottom and lower to the ground in its entirety. This depends upon the height, width and proximity to structures. Do You Want the Stump Removed? 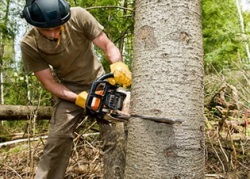 A landscape company can remove the stumps after cutting down your trees, but this will usually be at an additional cost. On average, stump grinding by a proffesional will cost somewhere around $100 for the first stump and then $25+ for each additional removal. The initial cost is based on the time and money it costs the landscaper to bring in the heavy equipment. Once they are there, have every stump you want removed done at one time. Drop and Leave, or Cut Up and Remove? If the cost of your tree removal is already at the top of your budget, then you can save quite a bit by not asking the company to cut up and remove it from your property. This process takes a lot of time and contractors will be willing to cut you a deal if you want to take on this yourself. If you are handy with a chainsaw and have a few helping hands, you can cut the tree into firewood and sell it. Even at $10 for a stack, this could really help offset the cost of the removal. This can be quite a job, so make sure you are up to the challenge before you have a company leave the tree on your property. If you don’t have the time to do it, pay the additional for haul away. As you can see, tree removal from a professional can be cost effective, especially if you choose to do some of the work yourself. 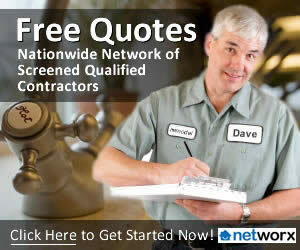 The main thing you need to remember is that most tree removal is not a do it yourself project because of safety issues. Leave it to a landscape contractor, then sit back and watch! Do you have any tips for tree removal at your home? If so, please share with our other readers! We had a 150 foot birch taken down last summer. it was hanging over the house and we expected a huge bill from the tree removal service. $400 bucks… worth every penny. We had them drop it onto the backlot and just cut it up into manageable sizes to allow to rot.